Christopher Lao's name is very famous nowadays! He's already a trending topic on Twitter because of his “floating car” video. 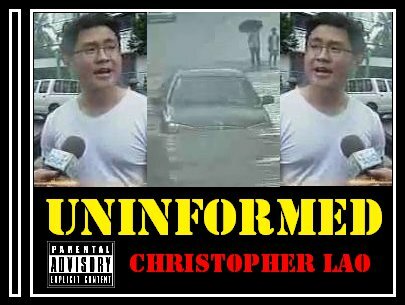 He is also the topic of many blogs and a Facebook Fan Page called “Christopher Lao (ang bobong sinugod ang kotse sa baha)” already created for him and got 40,000 plus likes now! 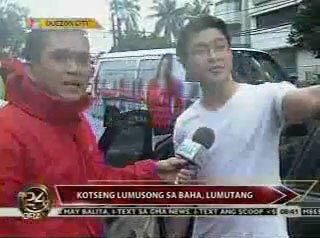 Lao became famous after GMA-7 reported about his “floating” car in their news program "24 Oras" last Tuesday. The video of his segment in "24 Oras" was uploaded in YouTube. The incident was caught on camera by GMA-7 reporter Jun Veneracion. The man driving the said car was Christopher Lao, a UP College of Law student, who braced his car to the deep flood waters in Quezon City. “Why didn’t you guys tell me?”. “I should have been informed”. From this said incident, hope that we all learned a lesson instead of throwing laughter and fun against Christopher Lao.